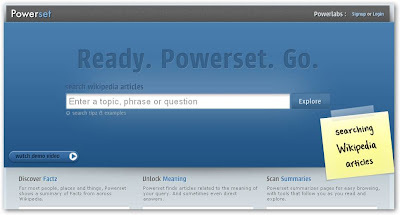 Powerset, the search engine that promises to rival Google, has finally opened its doors to the searching public. The company uses "natural language search" to make sense of your search queries, aiming to deliver more insightful results. Right now, Powerset only searches Wikipedia articles, but despite the limited functionality, it shows wider promise. 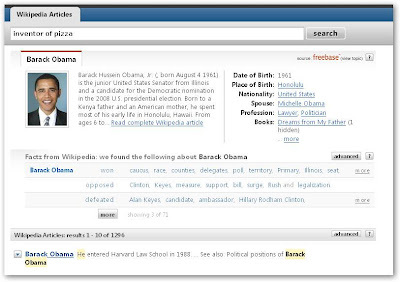 For instance, a Powerset search for "Barack Obama" brings up a brief biography culled from Freebase, listing brief facts like his date and place of birth, spouse, profession, and even books written. You can also refine your search with automatically generated keywords that are related to your search like "caucus", "delegates", and "primary." These are nice time-saving features that are missing from search engines like Google and Yahoo. If you're looking for information on companies, a search for "Google" pulls up some corporate stats like industry, stock symbol, founders, and date founded. Powerset is also smart enough to include the verb "to Google" in the search results. Of course, Powerset is setting the bar pretty low in this initial rollout, searching selected websites that have pre-structured information instead of the real-world mess of the vast majority of websites. To tackle that problem. Powerset is apparently looking for more funding and even a possible buyout.